This is going to be largely a review piece! 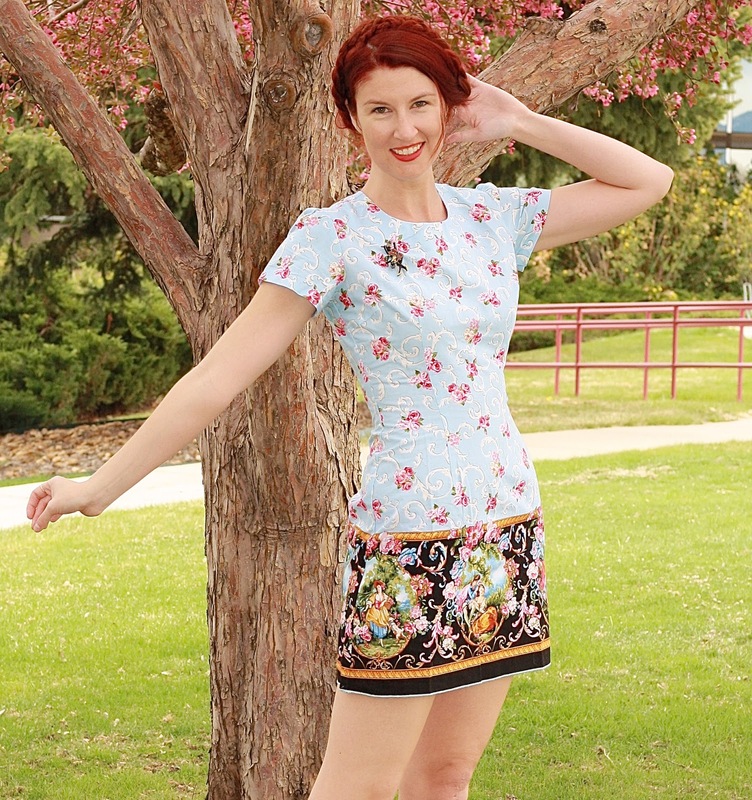 Vintage reproduction designer, Bernie Dexter, has recently introduced a new style (the Sharon dress) and I can’t say I’ve seen it pop up on too many ladies so far! (Currently Bernie doesn't even have this dress on her site otherwise I'd link this!). I got it in Zulily’s epic Bernie sale a few weeks back, so I thought I’d share my experiences. Honestly, I was nervous about this one! I’ve never gotten a fitted Bernie (read: one that isn’t open past the waist). Her sizing chart made me wonder if I should swap my usual XS for a Small, but I figured for the Zulily prices I should stick with what I know and I could always sell it if it didn’t work. The good news is that it fits really well! The not really good OR bad news is that it is quite fitted, meaning I definitely don’t have room to grow! Haha. (Good thing I'm currently enrolled in Krav Maga and getting the best workouts of my life?!) This is all fine and good, but part of my curiousty about this dress was wondering if it would be fitted versus closer to a shift dress. I didn’t care either or per se, but if I had to pick I was hoping for something closer to a shift dress. The photos on the site that popped up were slightly ambiguous and I was worried about ordering a size that would make the fit of the dress weird. So my bottom line advice is as follows: if you love this style stick with your normal size, unless you want it looser. Also, this dress is definitely the shortest vintage repo dress that I own. 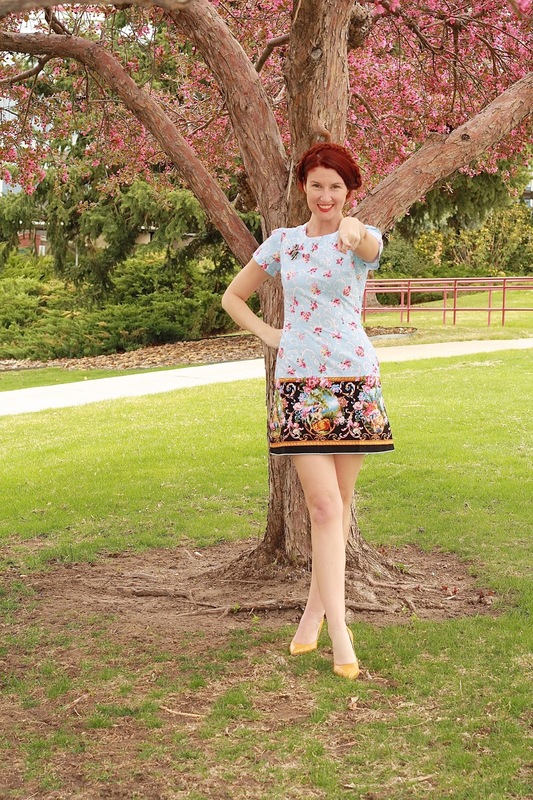 I never mind a short dress, but many of you ladies in vintage land do, so keep that in mind! Below are some multi-angle shots so you can see for yourselves how the dress is constructed and how it fits. Wow that is quite a shorter Bernie dress, looks great on you though Lauren! :) I'm actually blogging a Bernie dress soon, with that same print but a different style dress! Stunning print! So, I usually also gravitate away from fitted styles, but this one works so well. You look amazing in it too. Those classes are paying off! Gorgeous photos! Love you pretty dress! Such a cute dress Lauren-Blair! Happy Friday! You are in some serious work outs and they are paying off! Wishing you a wonderful weekend darling! such a fun dress! the print is fantastic! Such a stunning dress!!! The fabric, cut, color, print... Everything is perfect!! You look amazing! This dress is so beautiful and it's quite an unusual style for Bernie Dexter isn't it? Well, you're totally rocking it. You really are a sight in this! I am not used to seeing you in a more fitted skirt. Lovely! The size you picked looks perfect, and I like your braids. Holy cow, Lauren! You have a stunning figure and that dress literally looks like it was specially made for you! Are you still doing yoga? What a cute dress! I love the shoes too, such a unique color. They look really comfy too, are they? I loved loved loved the dress!!!!! It's beautiful, with two patterns, and both are great! So good it fits well, and yes, I am not used to wear that length, but it is so beautiful, I would do what I normally do when I love a certain print (like I did now!) - take to my seamstress and add some hem, to make it longer :) But look, you have a perfect figure, so you can wear it in a perfect way! You really really look gorgeous! By the way, I love Morrissey! Hope you have a lovely weekend! I'm digging the new blog layout! Also, this dress is seriously gorgeous, and the fit is absolutely perfect on you! I hope Zulily works out the kinks with these Bernie events soon, because she is killing it with great designs/prints lately! Have we had the Cure vs. Smiths conversation yet? Honestly, I'm not a one-or-the-other type, but I know a lot of people are. The Cure played such a huge role in my life for such a long time, but I think the Smiths are pretty great too! I love this dress! Would love to wear something like it. This is a super cute dress and it looks great with your hair and shoes! Very chic outfit! I love everything about it, very much including that darling Erstwilder brooch (they're a total obsession of mine, too! :)). Wow! I've never seen this style of Bernie's before. I would have never guessed it was a Bernie Dexter dress! How fun that it's so different from her usual styles! Looks great on you!